Now that I’ve gone to a once a week training schedule for boxing, I find myself getting really excited by the time Friday comes along. The daily fitness routine I’ve found that can work with my schedule these days is based around early morning yoga, but it’s the thought of boxing that gets me pumped up and ready to go. My Saturday morning boxing routine begins with dropping my daughter off for her Aikido practice, after which I take a nice long walk over to Gleason’s Gym. By the time I get there I’ve logged 2-1/2 miles at a pretty fast pace so I am nice and loose. About a 1/2 mile out, I start pumping my arms a bit so that by the time I hit the gym I feel ready for one of my two favorites: three rounds on the double-ended bag or three rounds of shadow boxing using the slip-rope. For those who don’t usually practice, the slip-rope is real old-school consisting of something as simple as a clothes line tied between two poles or across the ring around 15 feet apart at about chest height. 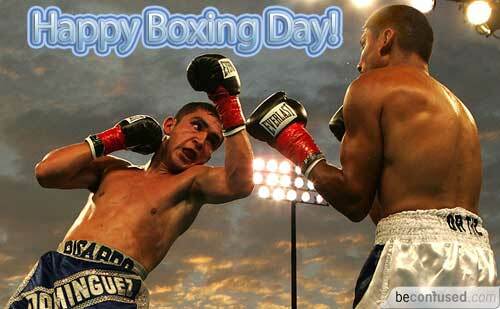 The object is to move forwards and backwards along the line and “slip” under as practice for slipping a punch. 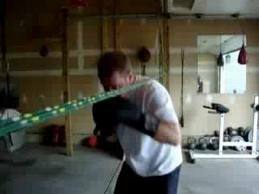 The slip-rope is also great for practicing upper cuts under the line — or for simulating jabs to the body and jabs to the head. By around the third round, I feel loose enough to dance around the slip-rope going forwards, backwards, and circling. Having the rope at chest height not only helps to “remind” me to slip, but also gives me an approximation of where to place body versus head punches. Alternatively, I’ll use the double-ended bag for warm-ups starting with a round of lefts and finishing the second two rounds with combinations and a lot of hooks or upper cuts off the jab. If I can train with Lennox Blackmore, we’ll do three rounds of pad work — with an aim of getting to four rounds by the end of January, five rounds by the end of February and six rounds by the end of March! Once we’re done with the pads, it’s back to the double-ended bag for three rounds to work on punches and combinations that Lennox and I focused on during the training session on the pads. This helps to solidify moves, especially slipping punches to counter — a Lennox special. 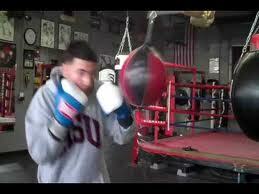 After that, it’s on to the speed bag for three rounds and then a whole lotta’ abs! I’ll add that if Len isn’t around, I might work-out for three rounds on the heavy bag in lieu of pad work, or add in an extra three on the double-ended bag. By the end I’m exhausted, but happy — and ready for the quick walk back over to pick-up my daughter. I hope to keep this going for about three months so that by April I’ll be fit enough to get back into the ring for some light sparring. We’ll see! Thanks. The slip-rope is really the coolest. My first trainer, Johnny Grinage was a real devotee of it. I trained 3-4 days a week then and he had me using the slip-rope at least twice a week.